Guillermo del Toro’s first film in five years, Pacific Rim pretty much delivers on what was promised in the trailer…and not much else. This is the ultimate mash up of Godzilla, ‘Voltron: Defender of the Universe’, ‘Neon Genesis Evangelion’ and Transformers. It’s spectacle filmmaking with nothing in the way of sub-plots or nuance. With a budget of $190 million, I don’t suppose we could have expected anything more complex than the simplest of blockbusters, but all the same it’s a little disappointing every time someone opens their mouth in this film. 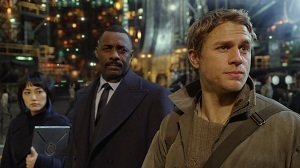 Idris Elba does a commendable job as Stacker Pentecost – as only an actor as brilliant as he could – but heroic lead Charlie Hunnam is all kinds of bland as Raleigh Becket. Rinko Kikuchi delivers a decent and mostly believable performance as Mako Mori, whilst Charlie Day (Dr. Newton Geiszler) and Burn Gorman (Gottlieb) turn their pantomime settings up to 11 as a couple of oddball scientists. The plot is covered by one of my pet hates – an all-encompassing voice over in the first three minutes – but if you really need to know before you go, it involves a rift that’s opened up on the ocean floor, unleashing all manner of Kaiju. The governments of Earth have responded by creating the Jaeger program – huge mechs controlled by human pilots – and sending them off to battle the giant monsters. The visual effects are stunning, however it was often hard to distinguish between the behemoths and the backgrounds. I’m not talking about Transformers-like heights of visual confusion, but it would be best if you sit as far away from the screen as possible. All the fights happen rather conveniently during rain swept nights – it’s like Jurassic Park all over again – and in order to prevent the action resembling nothing more than a computer game, the camera gets right in on the action. This means it’s hard to follow what’s going on. I can only imagine that this problem would be worse if viewing the film in 3D. Pacific Rim is a surprisingly comedic film – sometimes on purpose, sometimes accidentally – and the pace never slows. Whilst the number of titanic battles is few, there’s always something going on – people are punching and/or shouting even in the most intimate of settings – and the film never drags. The action is excellent, however, and I’m pretty sure if I were nine, I’d think this was the Coolest Movie Ever. A colleague of mine complained that del Toro seems to make two kinds of films, Chronos, Pan’s Labyrinth and The Devil’s Backbone being his more thoughtful, meditative projects, whilst Blade II, the Hellboy films and now Pacific Rim as his big budget crowd pleasers. I’m not entirely sure that this division is entirely appropriate, because all these films feel like the work of one man to me. One thing’s for sure, however: this is easily the most primal and simplistic feature he’s made thus far. It might be more consistent than another recent mega-budgeted spectacle, Man of Steel, but the latter aimed a little higher and was occasionally successful in doing so.